The Asia-Pacific offers enormous potential for Canada. The hard part is balancing economics, human rights and the U.S.-China rivalry. Successive actions and statements by the Canadian government have highlighted how Asia has become one of the country’s top priorities. The question isn’t so much why this is happening – that should be obvious. After all, China, India, Indonesia, and other ASEAN states boast huge markets, rapidly growing economies, and extraordinary investment potential. By the mid-21st century, these countries (along with Brazil and South Africa) will have a combined GNP larger than the G-8. And while neither China nor India will eclipse the United States as the globe’s premier power in the foreseeable future, the post-war American hegemonic order in the region is waning. So the key question is can Canada engage Asia in a way that can satisfy a complex web of sometimes conflicting priorities – namely democracy promotion, good governance, human rights and economic prosperity? And can Ottawa do so in a way that leaves the country stronger and more united than it was before the economic crisis, despite the increasing divide between the engines of growth located in western Canada and the weaker performing manufacturing sectors in eastern Canada? Certainly, on the economic front, the Asia-Pacific has much to offer Canada, and vice-versa. East Asia’s astounding growth rates since 1997 are simple enough to understand and digest, and their policy implications are clear: seek trade deals and investment guarantees, and ride the growing wave of Asia’s middle class. The Canadian government’s ability to secure these deals will rely largely upon its willingness to challenge some of Canada’s relatively well protected domestic industries. But Ottawa faces a handicap in that Asia is a blind spot for most Canadians. If Canadian businesses and universities are going to take advantage of this momentous shift of economic power, they will require nudging from Ottawa, and the government will need to place these “priority countries” at the top of domestic policy agendas, not just guidance documents. Canada should also devote considerable resources to G-20 diplomacy, given the tremendous risks that large, sustained financial imbalances pose to the global economy (demonstrated by the 2008 financial crisis and the ongoing Eurozone debt debacle, which at its heart, a current account imbalance problem). Establishing a more sustainable savings and consumption dynamic will benefit both Canada and its Asian economic partners in the long-run, and the institutional tools exist: they simply need to be better used. However, if the implications of Asia’s economic rise are clear for Canada, other facets of a New Asian century are more opaque. Canada has little leverage with China or emerging economic powerhouses such as Indonesia on human rights or democracy promotion. This is a result of both Canada’s modest (but not small) economic clout, and a lack of a history of engaging with Asia-Pacific nations. Still, it throws a proverbial wrench into the new foreign policy plan: how will Canada, for example, promote human rights in China? 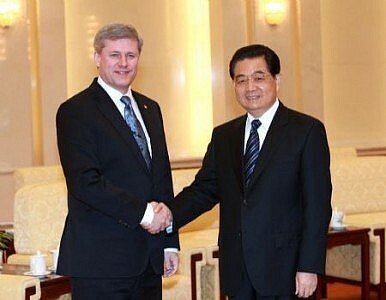 As Canadian Prime Minister Stephen Harper has learned, taking a hard tack on that earns one little sway in Beijing. Thus, there is an argument for not linking the human rights agenda to trade talks: it would be folly to sacrifice otherwise beneficial economic deals on the altar of a human rights agenda that we aren’t in a position to defend. Engaging China and others on these sensitive issues is best done slowly, and through quiet and effective diplomacy. Navigating the Pacific will also require careful charting of a number of shoals and reefs: problems hidden below the surface that are only dangers if one blunders into them. As noted, China and India’s relative rise necessarily means that the United States’ absolute hegemony in the region is ending. Japan and Russia are both experiencing demographic-driven declines. While they aren’t destined to fade out of the scene entirely, they will need to adjust to better accommodate China and a host of fast-growing emerging economies. Canada must fashion its foreign policy with this evolving balance of power in mind. This foreign policy should plan for contingencies beyond issues of democracy and human rights promotion. It needs to be aware of the hard security risks that a rapidly changing balance of power creates, and should focus on contributing to Asia’s evolving security architecture in a constructive fashion. If China is right, then there is enough oil under the South China Sea to feed global consumption for several years. But Beijing may be making an aggressive bet on the wrong horse.